Born in Portugal, Carmen Miranda was just one-year old when she moved with her family to Rio de Janeiro. At first singing on the radio and in Rio nightclubs, she made her first records at the beginning of the 30s. She quickly became the favorite interpreter of songs by the great samba composers such as Assis Valente, Lamartine Babo and Braguinha. Among her many recordings are classics of Brazilian music like “O que é que a baiana tem”, by Dorival Caymmi, and “No tabuleiro da baiana”, by Ary Barroso. In the forties, Carmen began her film career, becoming internationally famous with a dozen Hollywood-produced movies. Among her more famous films are Down Argentine Way, Weekend in Havana, Springtime in the Rockies and Four Jills in a Jeep. Success made her one of the highest-paid stars in American show business. 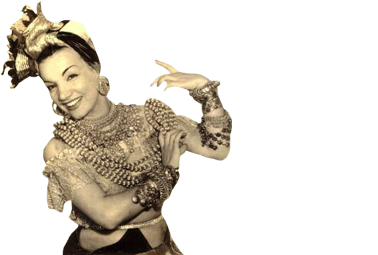 With her stereotyped Bahiana costumes and the tropical fruit adorning her head that defined her image, Carmen Miranda, the “pequena notável” (“small, but remarkable”), portrayed an image to the world that was a stereotyped caricature of Brazil. At the height of the “Good Neighbor” policy between the US and South America, her Latin image was exploited to the maximum by the studios. This international exposure gave rise to a certain feeling of disdain in Brazilian intellectuals, who accused her of having become Americanized. Images of Carmen Miranda became fashionable again during the Tropicalst movement. An icon of popular culture and of esthetic exaggeration, her figure was evoked not so much for its musical importance, but more for its links to a stereotyped and “tropical” image of Brazil. The singer came to be one of the Tropicalist icons, with references made to her both in the lyrics of songs such as “Tropicália”, by Caetano Veloso, and in the imitation of her stage mannerisms – the twisting hands and rolling eyes – with which Caetano Veloso more than once entertained/provoked the audience.